I've tried many granola recipes, including adding white or dark chocolate chips, or a recipe similar to this but using coconut oil, dried flake coconut, almonds and different dried fruit. I particularly like this one as some folks have a real aversion to coconut (invokes strong feelings in two of my friends) and some don't want to munch on chocolate with their breakfast. Better as a dry evening snack. 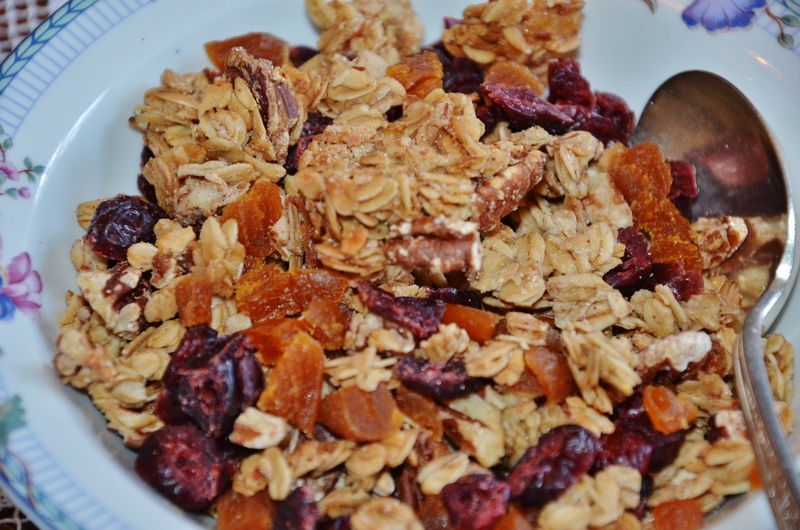 At any rate, as with any granola recipe, don't leave out the oil, it really changes the texture, hand chop your nuts, pack it tight on the rimmed baking sheet before baking and lastly, I like storing my dried fruit in a separate Tupperware from the granola itself. Sprinkle it on before you eat each morning. Keeps the cereal crunchier. Stir together syrup, brown sugar, salt and vanilla in a large bowl. Add oatmeal and pecans and stir until coated. Place on a parchment lined lipped cookie sheet. Press down firmly. Bake about 40 to 45 minutes, turning once halfway through. Let cool completely, at least an hour before placing in an airtight container. I keep the cut up dried fruit in a separate container and add to the bowl each morning.